A cafe inspired by images of small village cafes found scattered in many European, Asian and American countries, now positioned in one of the go to foodie destinations in QC. If you happen to look for a place, that's quaint and where people who loves to travel and talk about these village cafes and share unerring gustatory passion hang out, search no more, for I will share you one of the top hidden gem in the foodie lists. Maginhawa’s recent development as a food hub had actually long been established. I've read many accounts from blogs, social media networks and of course in the glossies, of the burgeoning haven that's located near one of the prestigious universities of our country - University of the Philippines. What used to be a quiet residential lane, Maginhawa Street at Teacher’s Village is now peppered with cafés, bars and hole-in-the-wall restaurants. You won’t see any fast food franchises here; the unique specialty stores give the area a vibe that is less commercial and a tad secluded. As much as I would want to share epicurean delights on this side of food central, I can only share one. Boo me, it was long since I've been wanting to have foodie out-takes in Maginhawa. Well for one, I live far from Queon City. Another reason would be, no one would want to come with me here and partake of such gustatory wonder, or I have not invited anyone yet. So when an invite from a friend came, I didn't hesitate anymore, wouldn't that be an enough reason for me to brave the traffic from south to north. Yet indeed, it was one revealing night, as the taxi cab cruised along the 2 kilometer stretch, that is said to be Maginhawa. I got all giddy seeing all the restaurants and cafe's I have on my bucket list. All the more curious of how Galli Village Cafe would be. 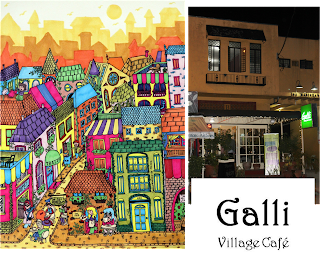 Galli Village Cafe has opened their second branch in the said venue. The first one is at San Antonio Village Makati. Now has gained popularity, among the nearby Makati goers and workers. Now serving their classic specialties to a different market (so they say), Paella Valenciana will easily win you over. This paellera, can either serve two to three people (P 255) or a bigger one for four to five (P 495). This kind of Paella is a rich meaty dish. Chicken meat, green beans and chorizo are mixed with rice (Jasmine rice to be specific), slow-cooked in savory saffron infused broth. What I like about their Paella is that aside from not over-whelmingly flavored, the price is competitively lower than other known Paella serving restaurants, except with Dulcinea, which is of the same price, with the flavor more like it. Since the family's background came from the same family names behind the more famous Dulcinea. Oh, don't be shy asking if they could scrape off the semi-burnt rice stuck to the bottom, it is where the saffron flavor is concentrated. One recommendation though if you are planning to have Paella, to make sure to call ahead, so they can prepare it already as you come, in that way you won't be waiting for 45 minutes to savor an authentic Valencia type Paella at Galli. One dish that's good to go with Paella is Beef Salpicao (P 195 /order with rice). Another slow-cooked dish that's a popular among Spanish cuisine, but with a few tweaks from Galli's kitchen. I'm guessing an addition of anato oil in the classic recipe (you can always correct me though). But they are as good as with our lola's typical home-cooked Salpicao, that's tender and garlicky to every bite. How can a plate of gambas be not present in a Spanish menu? A hit in their Makati branch, this will soon be raved by the QC foodies. You can see how the shrimps are fresh -plump and juicy. And just like any resto specializing in the same cuisine, this is served with a spike of chili, but nt to the point of burning your palate and not anymore enjoying the other dishes on the table. At the fare price of P 195, it is already served with rice. Not on the menu yet is this Tuna Salpicao. Though they have already established their menu choices, they are still on the verge of creating new ones, inspired from the rising needs of the customers, of course. Though they do have a fish dish, the Fish Fillet with Lemon Butter Sauce, they've added, Tuna Salpicao. Done the same way as the Beef Salpicao. Another crowd-favorite is the Angus Beef Tapa. A typical bar chow for some, but for the carnivorous eaters it's best with rice. The owners pride themselves with serving the best or what they think the customers would love without sacrificing the quality. Like the chorizos, the tapas are made from scratch in their kitchens, making sure that the flavor is consistent and that what comes on your table are the family's own favorites. One can opt to have a plain rice, if Paella is not enough, or their unique version of Fried Rice. I say unique because the rice is a bit sticky but not oily and fairly flavored with chorizo bits. Perfect for that breakfast for lunch kinda meal. Yes, they serve an ample sampling of All-Day Breakfast in Filipino and American style. To cap of the delicious night, leche flans were served to us. 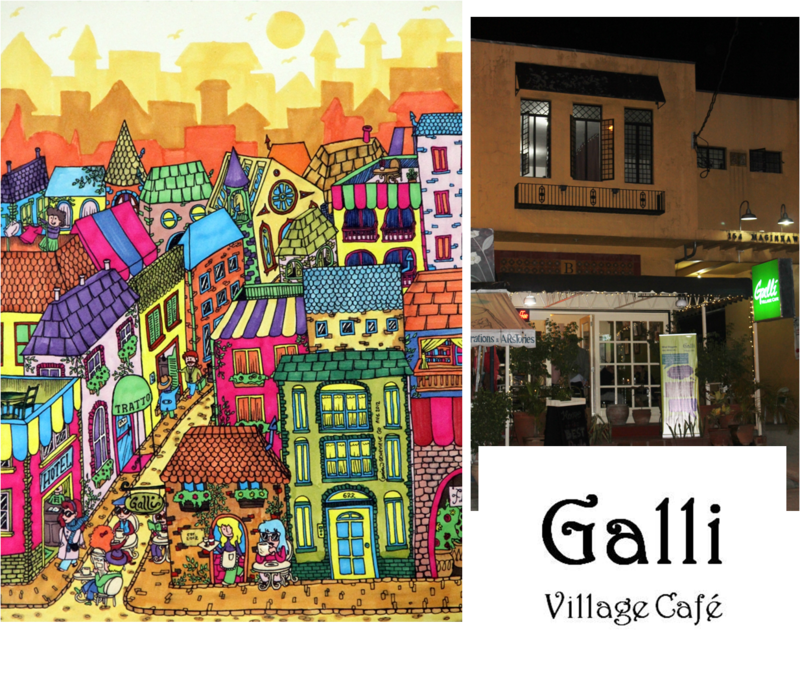 I've provided the copy of their menu's for you to see other good stuff from Galli Village Cafe. Quezon City Address: 154 Maginhawa St, Sikatuna Village, Q. C.
In Ilonggo Maginhawa means to breathe or to have a relief. 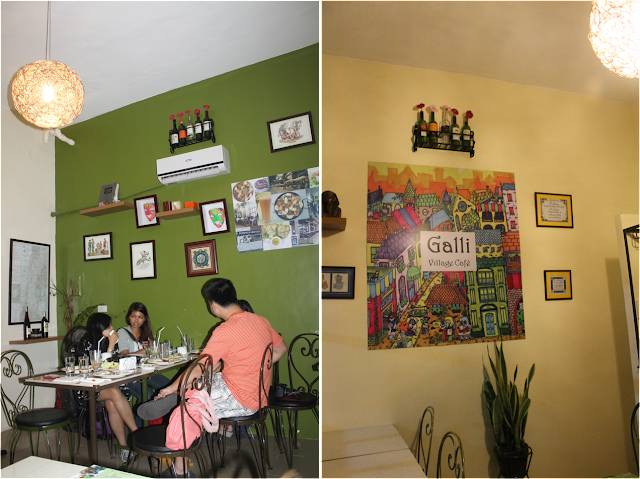 Maginhawa is an appropriate place for this resto with Spanish cuisine to savor with. The place speaks of perfect privacy, the foods look good. I'm more interested with their paella since I love paella! Yum yum yum! I am more inclined to try the paella. Looks delish. The restaurant looks cozy and perfect for couple's dates. If given a chance to visit there, I'll go with Gambas and Tuna Salpicao. They look delectable and appetizing. Their menu presentation is cool and interesting. This is the first time that I've heard of this resto and I'm glad that they have a branch in Makati. I'll probably visit that one and try their paella! Yummy gastronomic foods just by looking at the food photos. Hope they will open a branch here in Davao City. Got to try Galli Village Cafe just a few weeks ago. :) Love their Lengua Con Setas!